Weather looks brilliant for your trip across. Safe riding. Great that Digger is on the road again as it gives us couch potatoes something to vicariously monitor as he Clacklines his way east. Woke to a heavy shower at 6:00 am and thought that I had put the mockers on the weather for his ride. Fortunately a check of the radar showed that it was very localised and Digger being a north of the river guy meant he should have missed it. Digger is already past the Westonia turnoff on the Great Eastern Highway making good progress towards Thredbo. Digger has had a typical start to his cross country journey by making Balladonia covering 929 kms on day 1. It is also a radio station listened to by the BMWMCCWA demographic and a flash model of Mazda. The distance to Thredbo will depend on how much of NSW and Victoria Digger travels through is around 3,800 km. 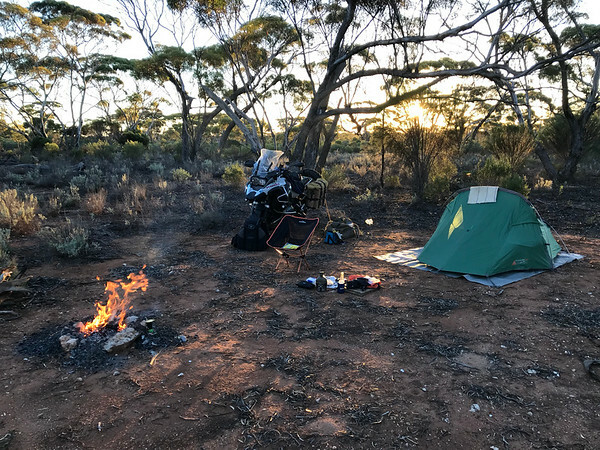 If Digger gets to Ceduna tomorrow travelling just over 1,000 km (after losing 45 minutes at Cocklebiddy and another 1 hour 45 minutes at the border) he will be half way. Eucla, Nullarbor and Ceduna all have maximum forecasts for tomorrow of under 30. I’m on track....1,000 km down (almost) with 3,000km to go. Expect to be at Ceduna tomorrow night (Wednesday) but will stop to take some (Mongrel Dog) footage from time to time. So far, so good. It is with great sadness and a heavy heart that I wish to advise of the passing of Lil’ Sanyo, my constant companion of 20 years. Those Slackers who have ridden with me in far Outback places would realise what a blessing this little radio had been throughout the years. 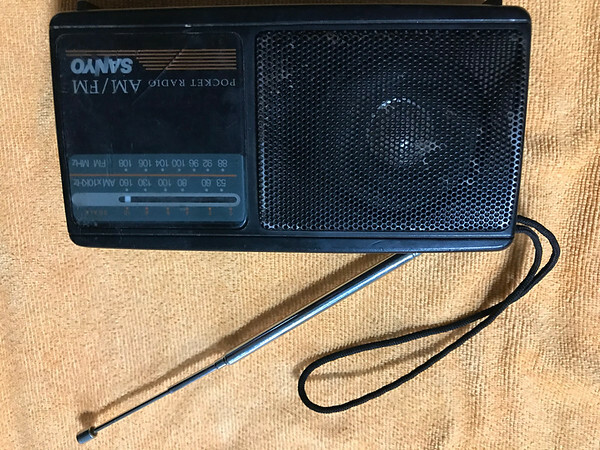 No one has been able to match the reception and signals that this radio has been able to achieve, regardless how hard they have tried. This radio has travelled with me throughout the world and throughout Australia and will be greatly missed. A suitable service will be conducted when I get the chance (possibly Cameron’s Corner or Innaminka...Lil’ Sanyo would like that) and those affected are encouraged to donate to a charity of their choosing. On an upside....at least I won’t have to listen to f***en Macca on Sunday mornings anymore. RIP Lil’ Sanyo. The World will not be the same now that you are no longer here. Condolences Digger. I only knew Lil’ Sanyo for a very short while. What I did see was a hardworking, loyal travelling companion. No more Macca, what a blessing. Just a thought - knowing your frugal nature, it's appropriate that I should ask you if you know that the batteries expire? Sort of know how you feel. 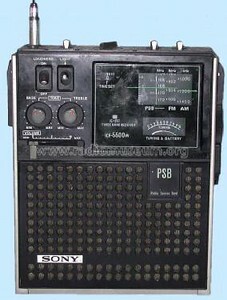 I had a Sony 5500 that I carted all around Western Australia in the 1970's and 1980's being devastated when its toggle switches failed to function. Such sentimentality is unbecoming of you Digger. Toss it in the next P bin and move on. My Tecsun will stave off Macca for you. Proven in the field of battle (Gunbarrel, Transcon etc) over the last couple of years. Has only had tent duties till now... I've been happy to save on batteries whilst lil sanyo kept its owner 'erect' doing its fireside thing. There is a God...been able to source a replacement (identical) from fleabay. Should be in the mail already. Bloke only wanted $2,500 for it. Hell, happy to pay that. Thanks for all your concern(s) and yes, I tried new batteries. Even tried jump starting it. Nothin’ seemed to work. I still sleep with it under my pillow. Hard to move on...had the radio longer then I had both marriages. Should arrive at start point tomorrow (Saturday) and will bunker down somewhere and swap out the tyres early Sunday before ‘registration’. Let the games begin. Digger wrote: Hard to move on...had the radio longer then I had both marriages. Be brave, these are the trials and tribulations that unjust fate sends. Getting close now...in the High Country and staying at a caravan park 100km short of Thredbo. Interesting country around this neck of the woods. 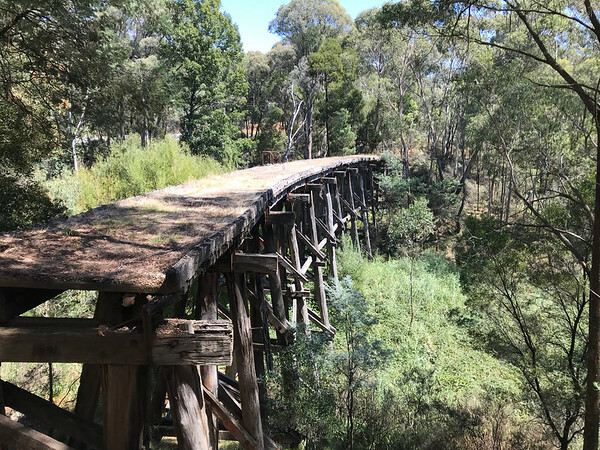 This trestle bridge use to be part of the rail system that went to the highest railway station (Shelley) in Victoria. 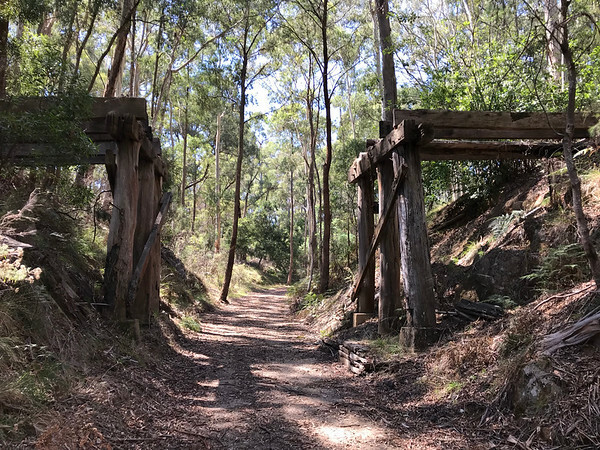 Now it is part of the High Country Rail Trail. I used to be in the Transport game....Tyre management is a bit of a science. It’s important to get bang for buck. 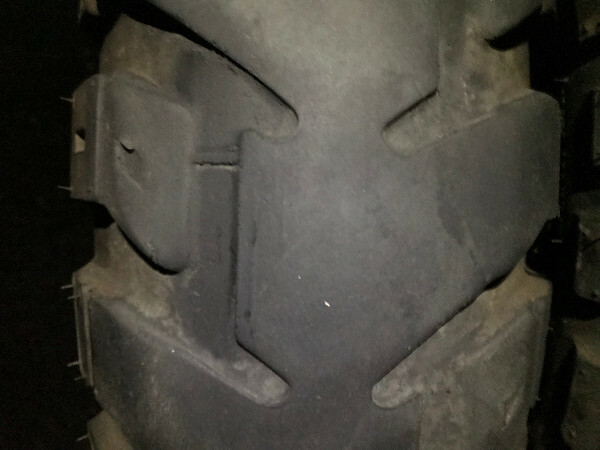 These long road rides are difficult to predict when it comes to Tyre wear. I get attached to radios...I dont get attached to tyres. This hiendeneu K60 was bought in Adelaide in Nov 2016 when I had to do a lot of road miles. I’ve swapped it out a couple of times since when a knobby Tyre was required. Unfortunately, I’m goin’ to have to jettison this Tyre when I reckon it’s good for another 5,000km. I’m gunna place it strategically in the scrub, mark it as a favourite on my GPS, and probably recycle it in the future when I need it. I’ve fitted a partly used Mitas E10 for the Safari and will probably refit a new Hiendenau when the bike is serviced in Melbourne for the return journey. Swapping the rear Tyre out this afternoon was challenging...not enough oomph in my compressor and had to seek assistance from the locals to seal the bead. Hopefully the front won’t give me the same issues tomorrow at Thredbo. That tyre has a heap of tread left. Being from the transport industry, may be it could fall into a secure location near or even under Scammell's Lookout. Scammell trucks have been used by the military to move tanks for decades. Seems a perfect location for you and even if you are not heading to Thredbo again it is only 20 kms down the road from Khancoban. 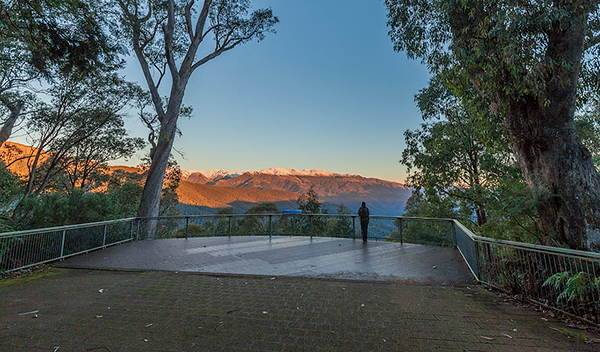 The lookout is worth a visit and you will have to pay the $7 park motorcycle fee as you are staying at Thredbo. Argh...sprung. It was just simpler to upload an image from off the web. Still a nice spot.